Pre-drawn circular diagram symbols represent circular motion, circle, trapezoid ring, basic loop, block loop, arrow loop circle, etc. These symbols help create accurate diagrams and documentation. Circular charting shapes like circular motion, trapezoid ring block loop, block loop, stack cirles, gradient circles, sector circle, sector rings, venn cycles, bevel style circle and more are available. All circular shapes except the last one have a floating action button. In an instant, with only a few clicks, the shapes can be changed into many different styles. 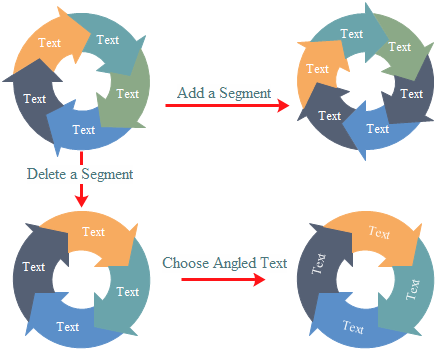 For instance, you can add/delete a segment of Circular Motion quite easily. And then you can change the text orientation. The Basic Loop shape includes not only floating menu, but also two control handles in yellow color, making it more flexible. 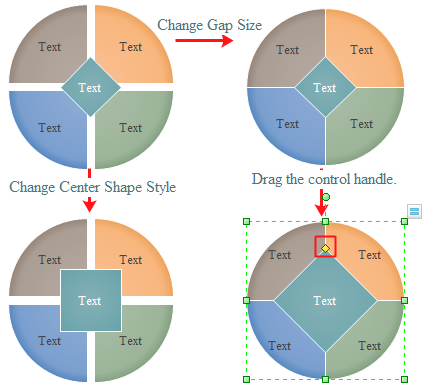 The left control handle is for gap adjustment and the right one for resizing subshape. See variations of Circular Pie from the picture below. The purpose of floating button and control handle is to ease your drawing. Rest the cursor over the shape to show the floating button. Select the shape to find the yellow diamond control handle. 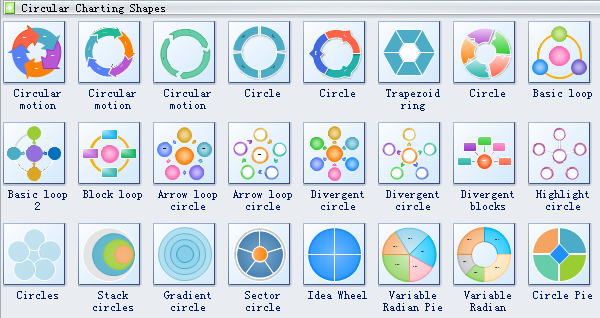 Need fresh looking circular diagram symbols for your design? 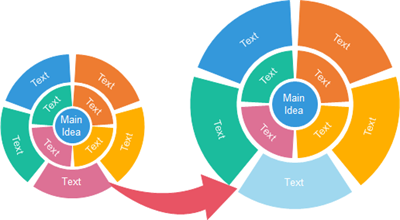 These circular diagram symbols are a cinch to pop in. And their crisp, fine detail will make spectacular, easy-to-understand diagrams and presentations to your customers.